It happens to every boat skipper nearly every time he heads out on the water, even when the weather is perfect and the seas are calm. The skipper and his crew are happily running along when another boat starts getting closer. Does he see you? If nobody changes course will there be a collision? Knowing the “Rules of the Road ” can help keep you and your crew safe, but unless the other guy knows the rules of the road you may need to take evasive action to avoid a crash. More than 3500 collisions are reported to the United States Coast Guard each year. 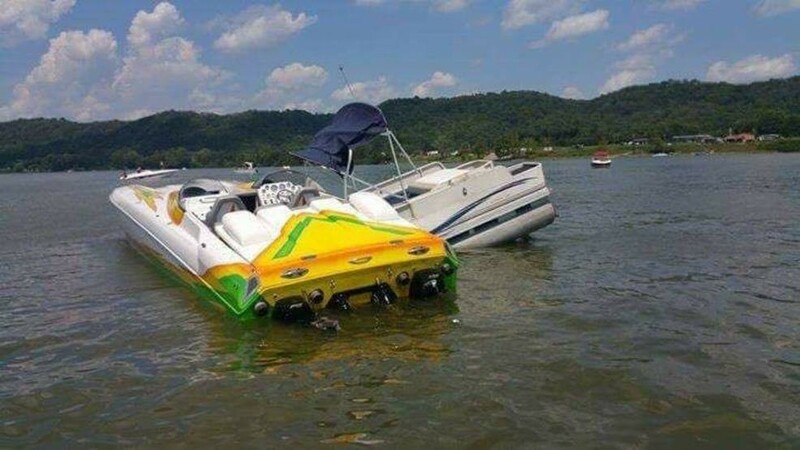 Collisions between boats are the most common type of accident on the water, with a high proportion of collisions involving personal injury or wrongful death. The biggest reported cause for collisions is keeping an improper lookout, in other words, not paying attention to where your vessel is going and where the other vessel is going. Nearly all boating collisions can be prevented simply by maintaining a proper lookout and following the Rules of the Road. It is important to note that nearly half of recreational boaters are not familiar with the basic rules of safe vessel operation. Therefore, never assume that the other guy knows what he is doing. Just as a reminder, the port side of the vessel is the left side of the vessel viewed from a forward facing standpoint. The starboard side of the vessel is the right side of the vessel. The terms “left and right” are not utilized on a boat because it is easy to get confused if some crew members are facing forward and some are facing aft because they may subjectively be thinking of their own personal left and right. Stand at the helm and face the bow (front) of the boat. Port is on your left. Starboard is on your right. Now, turn around and face the stern (back) of the boat. The port side of the vessel will now be on your right and the starboard side of the vessel will be on your left. Therefore, the port side of the vessel always remains the port side and the starboard side of the vessel always remains the starboard side. It does not matter which way the captain or crew is facing. Port and starboard sides always remain the same. How can you tell if a risk of collision exists? Well, the general rule is that if you aren’t sure, then you must assume that there is a risk of collision and take proper evasive action. In a situation where vessels are approaching each other head on, the general rule is that each vessel will maneuver so as to pass port to port. Boats, especially motor vessels, can easily travel at high rates of speed so there may not be much time to avoid a collision unless each vessel takes proper evasive measures early and distinctly. There isn’t a center line drawn down the middle of the highway when you are on the water and it can often be difficult to determine if a risk of collision is presented. Therefore, in the situation of approaching another vessel head on, turn your vessel to starboard after making sure that it is safe to do so by quickly performing a 360° lookout to check for overtaking vessels or approaching vessels. In most circumstances, the vessel approaching head on will observe that you are turning to starboard and he will perform a similar maneuver, allowing both vessels to safely pass port side to port side. In this situation, neither vessel has the right-of-way and both vessels are supposed to turn to starboard to safely pass each other. Suppose he doesn’t change course? Suppose he turns the wrong way and continues to head in your direction? A risk of collision is presented. The effectiveness of a course change should be continuously monitored until the other boat has safely passed. Each situation is unique. If a risk of collision is presented, many different evasive maneuvers can be utilized including speed reduction, speed increase, operation astern (backing up), course changes, radio contact or even having a crew member wave a towel or boat cushion overhead to try and obtain the attention of the inattentive oncoming boater. In this situation it is prudent to assume that he doesn’t see you, he isn’t going to see you, and that he is going to hit you unless you get out of the way. This is not the time or place to let pride or the knowledge that you are technically “in the right” from a navigational standpoint interfere with the safety of your vessel and crew. Just get out of the way and let the inattentive and clueless boater pass by. After the danger has passed, keep a close eye on the next oncoming boat. This type of situation happens quite often and especially on weekends on the busy Intracoastal Waterway. There are dozens and dozens of YouTube videos depicting boat collisions, some quite severe, that could have been easily avoided by maintaining a proper lookout and following the basic Rules of the Road. In the next article, we will discuss Crossing Situations and being Overtaken (Passed from behind) by another vessel.